Dying Light is back, and it’s coming with more features, a bigger world, and big overhauls to its day/night cycles. We got to experience a hands-off demo which followed roughly along with the Dying LIght 2 E3 Gameplay Trailer, but because it was being played live, several things went rather differently. It’s been 15 years since humanity lost their war with the infected, chaos and disorder rules, but there are those who are seeking to rebuild, and the seeds of civilization are being scattered across the scarred landscape. Dying Light 2 is narrative sandbox which allows you to make decisions which will literally change the shape the world and the course of history, but every action has consequence and no good deed will go unpunished. Dying LIght 2 also gives you the option to create a little chaos; after having helped the Peacekeepers take control of the water tower, just as in the gameplay trailer, we stood atop the platform, observing the world around us, when we looked down to see a PK guard sitting on the edge of the platform, feet dangling in the air. The option “Press X to push” presented itself as a way to break our alliance with the Peacekeepers, should we so desire. Switching save files, we took a moment to explore what the world would be like had we made a different choice, and helped out the squatters instead of the Peacekeepers. The change was immediate and obvious; without the Peacekeepers to innovate the area, adding running water and easier methods of traversing the barricades, we had to navigate the area using parkour. A man just beyond the barricade lay slumped, begging for water, while a few dozen yards away, people lined up to purchase water. A booming black market had sprung up, and because we helped make it happen, we will get a cut of the profit for as long as the market thrives. This was, as the developers told us, just the beginning of this storyline; allying with savvy businessmen could unlock a number of future business deals. There are many factions which you will encounter, the Scavengers, who are attempting to build humanity out of the new dark ages, being one which has not yet been shown. There are also bandits and gangs of ruffians who can be just as tough an opponent during the day as the Infected are at night. While Dying Light 2 will also feature random events and dynamic encounters, these will not be world-altering events, they will will generally unlock additional quests, provide access to small areas, or provide you with more information on a character or area. The combat system has also received an upgrade, with new AIs providing more challenging combat. You can’t simply hack away at your opponents, you’ll need to watch their attack patterns and wait for an opening. Humans will also get angry during combat, switching stances and becoming more aggressive when their attacks are deflected too many times. Before you can change the world, you have to navigate it, and there’s a lot of world to explore. 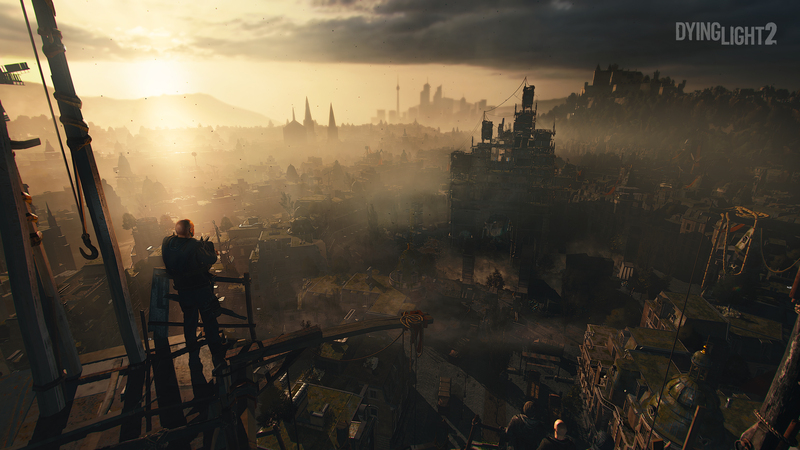 This fictional European city is four times as large as all of the maps from the original Dying Light combined, and you’ll be able to go literally anywhere and climb anything you can see. Even better, you now have twice the number of parkour moves at your disposal, so the impossible climb is now entirely possible, with the right set of moves. The game will test your skills with a new feature: the parkour puzzle. In order to pass these, you’ll need to examine the area, plan your moves, and execute them quickly, before your stamina runs out, or perfectly time and chain a number of moves; anything less than a flawless execution will have you falling to the hard ground below. Dying Light 2 also features physics-based movement, so the world feels more real and reactive, causing elevators, chains and other objects to move as they would in the real world when you interact with them. One of the biggest changes in Dying Light 2 will be the nighttime play. Many fans of the original found the night too dangerous to explore in, filled with too much terror and not enough reward. Techland is prepared to change that, giving you more incentives to go into the night, as well as more tools to keep you alive once you’re there. Because zombies are severely weakened by daylight, they tend to huddle together in areas during the day, sleeping as they wait for the sun to set. These zombie nests, known as “Dark Places,” are too dangerous to really explore when filled with sleeping terrors during the day, but for that very same reason, they generally contain large amounts of loot, a perfect place to explore after dark when the Infected are out hunting. Humanity has also had a little more time to figure out how to combat the Infected, and Dying Light 2 comes with even more weapons and tools to keep you alive. UV lights, grenades, and hiding spots other than safe houses await. While day belongs to humanity, Techland intends for the night to belong to you: this is a dark and dangerous world made for you to explore, to loot, and to conquer. Stay tuned for more E3 coverage here on Gaming Trend.